The Lhomi people live high in the eastern part of Nepal. The name itself describes the people and their history. “Lho” means “southern” and “-mi” means “people.” The Lhomi, ancestrally, are Tibetan people that migrated south to this region and now live in isolated villages that cling to the steep mountainsides surrounding the Arun Valley. There are 18 villages which are separated by dramatic terrain. Each village has slightly different traditions and understandings of their traditional festivals. When SIL LEAD consultant, Agatha van Ginkel, recently visited the Lhomi to conduct an evaluation of their adult literacy program, she began by flying from Kathmandu to the furthest village, Chepuwa, in a helicopter and then trekking to the other villages. Three lovely Lhomi women wearing their tradition dress. One bridge from Agatha's trek between Lhomi villages. According to the Ethnologue, the Lhomi population in Nepal, Tibet, and India is around 15,000. They are recognized by the Nepali government as an indigenous nationality but the education offered in local government schools has been only in Nepali, the national language of Nepal. Lhomi students experience high dropout rates and low attendance because of this language barrier. 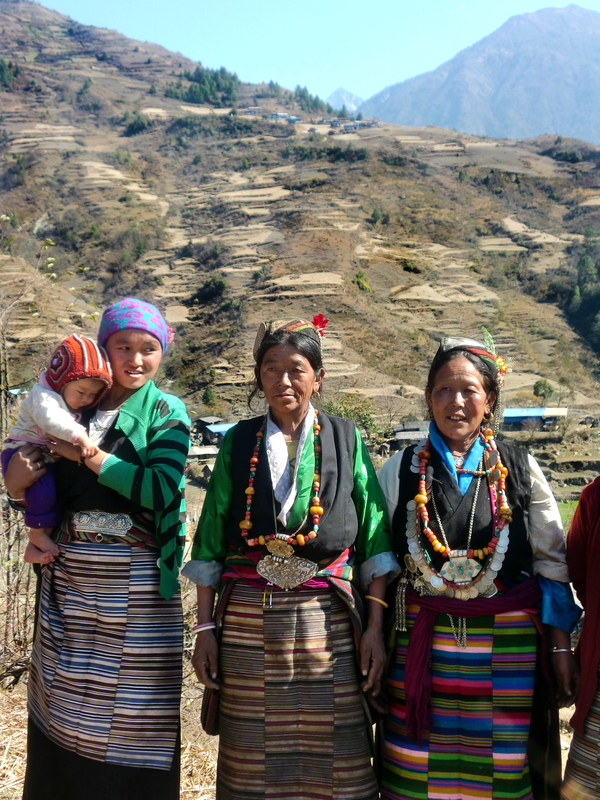 However, there are members of the Lhomi community who have started the Nepal Lhomi Society (NELHOS) to promote health education, adult literacy and development, libraries, and mother-tongue based multilingual education preschool programs. Village Youth Associations, mothers’ groups, and village committees, have been instrumental in programs like this that have helped to improve education and literacy among the Lhomi people and will continue to do so in the coming years. Just as they work hard to be self-sustaining, the Lhomi people are working hard to help preserve their language.